The Prodigal God: Recovering the Heart of the Christian Faith by Timothy Keller; © 2008 by Timothy Keller; Dutton: New York, NY, 139 pp. Every Christian should read this book. Beginning a book review like that may be bad form, but every Christian—backslidden or backboned, infant or mature, lawless or legalistic—really should read Timothy Keller’s The Prodigal God. The subtitle, Recovering the Heart of the Christian Faith, describes its purpose and explains why everyone should read it. 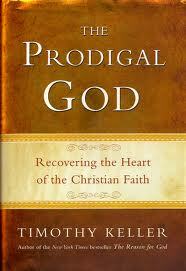 When someone recommended The Prodigal God by Timothy Keller, I made a mental note to read it. When a minister mentioned it in a sermon, I decided to look for it. When someone let me borrow their copy, I put it on my stack of books to read. When another pastor highly recommended it to me a little later, I moved it to the top of that stack. When I finally picked it up and read it, I understood why the Holy Spirit had been so insistent. The parable of the Prodigal Son had always been a bit problematic for me. I easily identified with the older son, who seemed to have a legitimate gripe. And I’d never felt as if I really understood the point of the parable. Sure, we’re supposed to forgive the wayward sinner who repents. But what about that older son? Of course, he should shown more love toward his brother, but didn’t he make some valid points? The Prodigal God was Convicting with a capital C.
Keller explains his title by correcting the common misperception that prodigal means wayward. He provides an accurate two-fold definition of prodigal as “recklessly extravagant” and “having spent everything” (p. 2). Keller writes that the two brothers represent different ways “to be alienated from God” and “to seek acceptance into the kingdom of heaven” (p. 7). Feeling like alienation and acceptance aren’t your problems? Convinced you understand the gospel? Keller believes “one of the signs that you may not grasp the unique, radical nature of the gospel is that you are certain that you do” (p. xi). “The targets of this story are not ‘wayward sinners’ but religious people who do everything the Bible requires,” Keller writes. “Jesus is pleading not so much with immoral outsiders as with moral insiders. He wants to show them their blindness, narrowness, and self-righteousness, and how these things are destroying both their own souls and the lives of the people around them” (p. 10). Comparing the parable to a play in two acts, Keller describes how Act 1 shows the freeness of God’s grace, while Act 2 shows “the costliness of that grace and the true climax of the story” (p. 25). Jesus uses the two brothers to demonstrate the two basic ways people try to find happiness and fulfillment: moral conformity and self-discovery (p. 29). Keller notes that the modern world seems divided into these two opposing perspectives, although some moralistic people practice both attitudes by separating public and secret aspects of their lives, and many modern liberals regard conservatives with self-righteousness to equal the worst Pharisee. Keller shows how Christ advocates a radical alternative. “The gospel is distinct from the other two approaches: In its view, everyone is wrong, everyone is loved, and everyone is called to recognize this and change” (p. 45). Everyone really needs to read this book and truthfully examine his or her own heart. While Keller never hesitates to confront each of us with the sickness of our hearts, he also writes the prescription: We need “the initiating love of the father, [a deep] gospel repentance… [and] the festival joy of salvation” (p. 79). Even if you’re not a younger brother or an elder brother, you’ve got tendencies toward one or the other. We can never hope to do anything that will secure the Father’s love, but believers have an older brother who’s done it all. “We will never stop being younger brothers or elder brothers until we acknowledge our need, rest by faith, and gaze in wonder at the work of our true elder brother, Jesus Christ” (p. 89), writes Keller. “We can only change permanently as we take the gospel more deeply into our understanding and into our hearts” (p. 115). Don’t put off reading this book as long as I did. But don’t just read it; take it to heart.